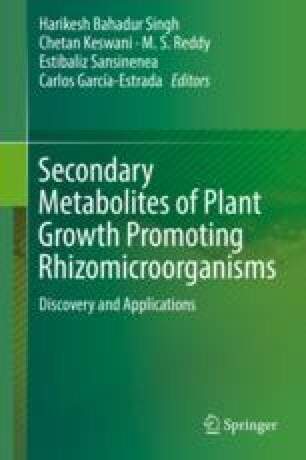 The main objective of the present study was to evaluate the phytopathogen biomass of Phytophthora capsici and Colletotrichum gloeosporioides as inducers of antifungal metabolites from Trichoderma asperellum. The experiment was carried out through a solid-state fermentation using corncob as support/substrate. Water, ethanol, and toluene were used to recover the antifungal metabolites. The strain of P. capsici was inhibited by the metabolites recovered from all extracts; however C. gloeosporioides resist them and develop a normal growth. The bioactive extracts were fractioned using Amberlite XAD16®, and each fraction was analyzed by LC-ESI-MS. LC-ESI-MS analysis showed two major compounds; an unknown compound (1) was detected as [M + H]− (m/z 478) while dihydroxybergamotene (2) as [M + H]− (m/z 260). In addition, other four compounds were detected: viridepyronone (3), koninginin D (4), acetyltetrahydroxyanthraquinone (5), and virone or gliotoxin (6). The results suggest that the biomass of P. capsici worked as an inducer of antibiotic compounds in T. asperellum.